Over the past couple of months, I have been conducting workshops for parents of young children to share my understanding of packaged foods. One of the most common questions I get is “What about muesli? Is it healthy? Can I have it everyday for breakfast?”. Firstly, I would highly recommend that you try and find out the answer by yourself. There are 1000s of packaged food brands in the supermarkets and I have managed to analyze ONLY around 50 of them so far. My intention is NOT to analyze each and every product. Rather my objective is to show how easy it is to understand and decipher the ingredients by yourself, so that as a consumer, you can make the right choice, before you add an item to your shopping cart. Read the labels - Ingredients list and nutrition facts table. Yes, as simple as that. Many years back, I used to have a bowl of Baggrys muesli every single day for breakfast. Because it was quick and convenient. After I started reading the ingredients, I no longer buy it. As a family, we no longer do the “cereal” business in the mornings anymore. The umpteen number of synthetic chemicals in the form of preservatives and flavours, sugar hidden in various forms and on top of it, the expensive price we had to pay for each box - we realised how ridiculous this habit is! The recent news about Glyphosate present in numerous breakfast cereals in the US is something that we all need to be aware of, especially those living in India who associate eating "cereal" breakfast with their self-esteem. Yesterday, we had a bowl of fruit salad for breakfast and today it was Rava Upma with a little lemon pickle. Our other options are idli, dosa, paratha, poha etc. INS 224 - potassium metabisulfite. May cause asthmatic and allergic reactions. INS 211 - sodium benzoate. Linked to hyperactivity and asthma. When combined with ascorbic acid (Vitamin C), sodium benzoate may form benzene, a known carcinogen. Why would we want to consume such harmful chemicals on a daily basis? 2) For a Serving size of 30gm, the amount of added Sugar (Sucrose) is 2.4 gm (or a little more than 1/2 tsp of sugar). It isn’t much, we might think. But take a look at this ingredient “Invert syrup”. It is composed of equal parts of glucose and fructose (the other kinds of sugar), the amounts of which are not shared. 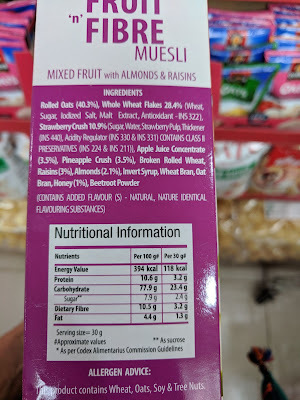 Having tasted this pack of Muesli, I can say that it is definitely on the sweeter side (much more than 1/2 tsp of sugar per serving size). 3) Most of us switch to oats and muesli mainly because of the “fibre”. But do they really have high fibre as they claim? For a serving size of 30 gm, the Dietary fibre present is ONLY 3.2 gm. The oats and wheat flakes are highly processed, that they hardly have any fibre. Starting the day with local fruits like guava, papaya and banana will give us much more fibre, along with various other vitamins and minerals. 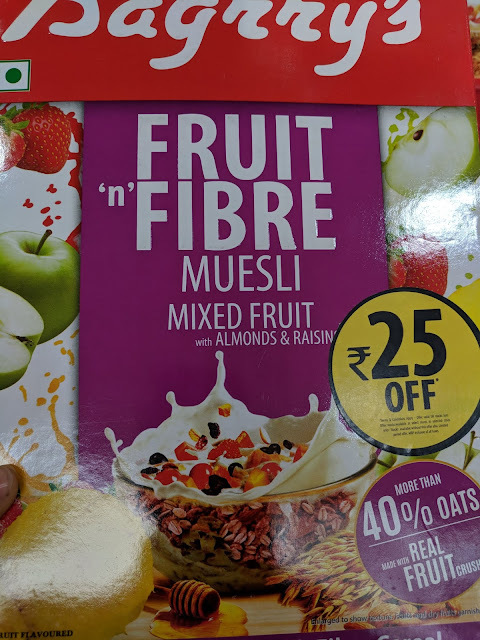 This is just one example of a Muesli brand. There are many other brands such as Kelloggs, Soulfull, Saffola etc. Before you pick one, read the ingredients - Are they all natural? Are there any unfamiliar names? What’s the sugar level per serving? Mindful shopping is the need of the hour. Let’s not dump things to our shopping cart, just because we have habituated ourselves to certain products and routines.